The Mini Countryman is neither small nor a man of the country, but it is a popular and premium small crossover. 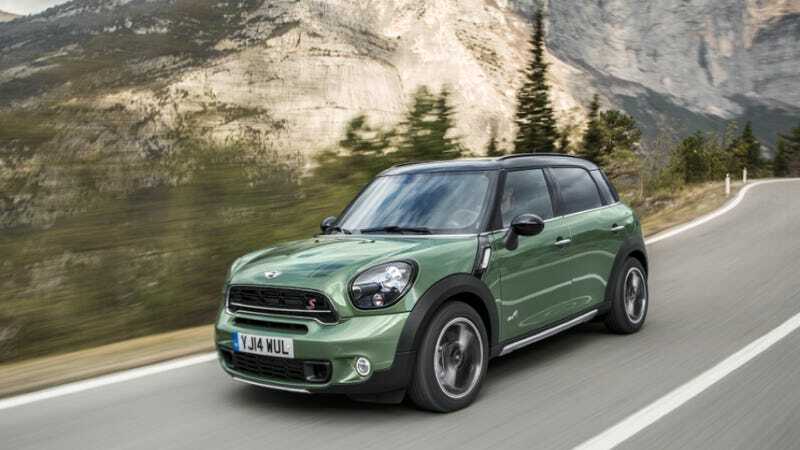 What do you need to know before you buy a Mini Countryman? Don’t worry, we’ll tell you everything right here in the Ultimate Buyer’s Guide. We’re a little verklempt over the Mini Countryman. On one hand, it actually isn’t that big and it does offer a nicer and more luxurious package than a lot of cars in this class. When kitted out with the S or JCW package it’s also not slow. A lot of people don’t love the aesthetics, but it’s at least unique. The question is: Are you’re willing to pay nearly $30,000 for the Cooper S All4 package when you could get a nicely equipped AWD model from almost any other automaker? If you’re all about touch-and-feel and you want a Mini you can’t go wrong with a Countryman, but for the price we’d be open to other options. The Countryman arrived on our shores for the 2011 model year and has received some small updates since then. 2012 brought a standard rear bench to replace that weird center rail, 2013 brought the sporty John Cooper Works trim, 2015 brought some minor changes to the Countryman like a new grille, new color options, and new wheels. This year’s 2016 model brings a new Park Lane package, but not much else, as a new Countryman based on the latest Mini platform is expected to arrive soon. Mini offers three versions of a 1.6L inline four. There’s the base 1.6L, available only on Cooper trim, which puts out 121 HP. The turbo version, available on the Cooper S and Cooper S All4, tacks on another 60 ponies. Finally, the most potent mill, the John Cooper Works turbo I4, which cranks out 208 horses and 192 torques. Fuel economy is competitive for the segment with the base Cooper and the Cooper S scoring about the same on the EPA’s fuel economy cycles. The John Cooper Works countryman loses a couple of combined MPG compared to the others, but it’s the more powerful performance engine, so that’s no surprise. All Countrymans manage 30 MPG or more on the highway. All Countrymans come with a MacPherson Strut front suspension, Multi-Link rear setup, and electric power steering. Front discs are ventilated 11.6 inches on the Cooper and 12.4 inches on the S models and JCW model. Rear discs are 11 inches in diameter and solid. Countrymans come in four trims: Cooper, Cooper S, Cooper S All4, and John Cooper Works All4. Cooper: Base model. Starts at $22,750. Notable standard features: 1.6-liter naturally aspirated I4, 6-speed Getrag manual transmission, 17” aluminum wheels, base leatherette seats, 7 airbags, push button start, keyless entry, power windows, 6-speaker stereo with HD radio and Bluetooth capability, heated mirrors, rain sensing wipers, auto lights, roof rails. Notable options: MINI Park Lane Edition: unique gray paint, red striping, red roof and mirrors, unique exterior trim, 18” dark gray aluminum wheels ($2,500); Cold Weather Package: heated front seats, auto dimming power folding mirrors; Sport Package: upgraded wheels, sport seats, white turn signals ($1,250); Premium Package: panoramic sunroof, Harman Kardon Sound System, proximity keyless entry ($1,800); Media Package: MINI Connected iPhone integration, 6.5” touchscreen, enhanced Bluetooth, center armrest with mobile docking, voice command ($750); Navigation Package: MINI connected iPhone integration, enhanced Bluetooth, center armrest with mobile docking, navigation system ($1,500); JCW Exterior Package: 18” alloy wheels, power folding mirrors, Piano black exterior, white hood stripes, white turn signals ($1,250); JCW interior package: JCW leather steering wheel, sport seats, JCW interior accents, piano black dash surface, unique headliner, dynamic traction control ($1,000); Fully Loaded package: Mini Connected with Navigation Package, Premium Package, Sport Package, Rear Park Distance Control, parking sensors, auto dimming power folding mirrors ($4,750); Sport suspension ($500). Cooper S: Starts at $26,100. Notable standard features over Cooper: 1.6-liter turbo I4, air scoop, bigger brakes with brake ducts, sports seats, black tailpipe, dual exhaust, Notable options: Mini Park Lane Edition ($2,500); Cold Weather Package: same as Cooper ($2,500); Sport Package: updated wheels, xenon headlights, white turn signals ($1,000); Premium Package: same as Cooper ($1,800); Media Package: Same as Cooper ($750); Navigation Package: Same as Cooper ($1,500); Fully Loaded Package: same as cooper ($4,500); JCW exterior package: unique wheels, aero kit and exterior trim ($3,250); JCW Interior Package: same as Cooper ($500); Sport Suspension ($500). Cooper S All4: Starts at $27,850. Notable standard features over Cooper S: all-wheel drive. Other features and options are the same as Cooper S.
John Cooper Works All4: Starts at $35,350. Notable standard features over Cooper S All4: Tuned higher horsepower 1.6-liter turbo I4, JCW tuned sport suspension, 18” wheels, unique steering wheel and JCW interior trim, sport dual exhaust, JCW aero kit. Notable options: Cold Weather Package: Same as Cooper ($750); Premium Package: same as Cooper ($1,800); Media Package: Same as Cooper ($750); Navigation Package: Same as Cooper ($750); Fully Loaded Package: Same as Cooper ($4000).